The Super Pollinators program offers three models to suit every budget. All models include the same dynamic presentation and display. In CLASS BUZZY, one hotel is made per class. 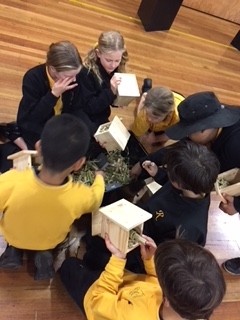 In TEAM BUZZY, students work in teams to construct one insect hotel between 5 students (that’s 2 nails each that need to be carefully hammered). 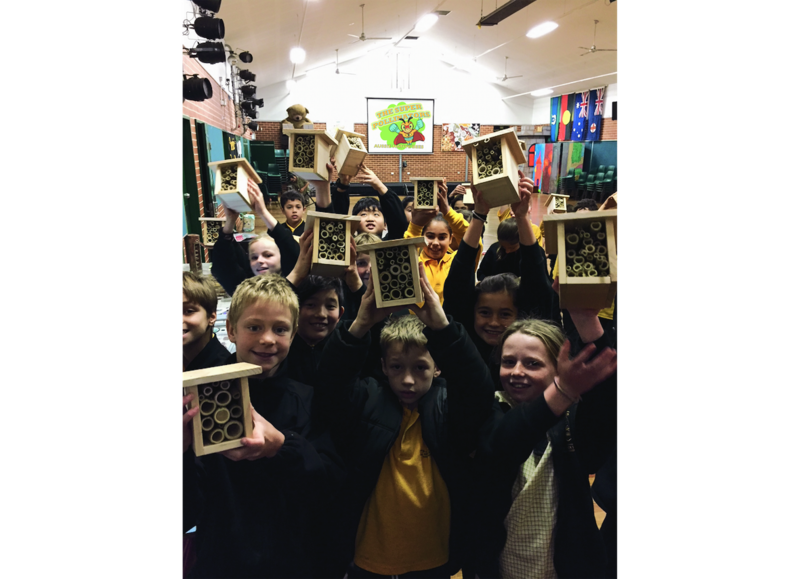 In our EVERY BUZZY program, every individual makes their own. 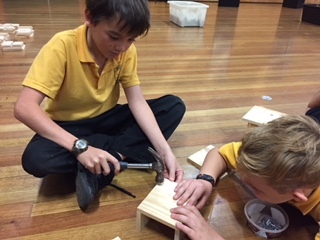 Students as young as 5 -6 years successfully work in pairs to create one each. 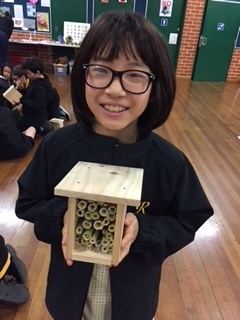 This month we hit a new record – 124 insect hotels made in just one day by Randwick Public School. 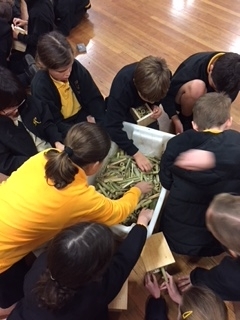 It was a massive day of 5 rolling workshops! Phew! 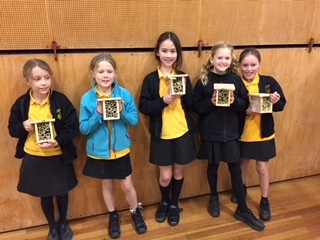 Following the presentation , these year 4 students know all about bees and their life cycles. Most native bees have an annual life cycle. As the weather cools off the nesting mother dies, leaving her off spring to overwinter in a tree stem or in the ground, or in a bee hotel! The new generation will hatch next spring ready to take on the world. 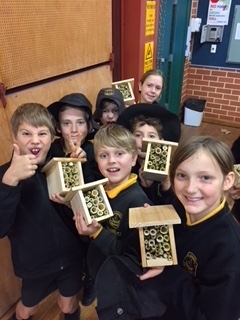 So this new batch of insect hotels will be painted up and taken home. 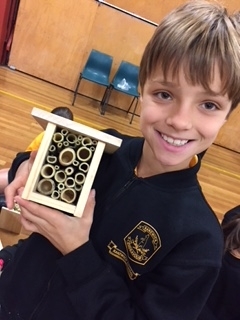 As the bees are dormant during winter the kids will wait until the weather warms up before installing them in their garden ready for the bees and other critters like solitary wasps (non aggressive), grasshoppers and other B & B guests. Great effort Randwick! 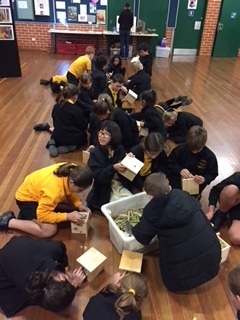 Fantastic incursion that students thoroughly enjoyed. Very interactive and informative. Very well linked to geography and science outcomes. The information was relevant and explained in a fun, simple way! Very engaging workshop, that has real world applications. Loved it! 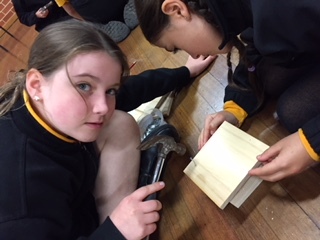 Outstanding workshop that covered everything curriculum wise – hands-on construction – all students thoroughly engaged. Excellent resources, all set out, easy to use, SUPER.